It is hoped the multi-million dinar investment in comfort and convenience will overcome deep-rooted prejudice against public transport that some locals and expats may have as residents and visitors are encouraged to try a ‘revamped service’ offering a ‘feasible travel alternative’. Fares, however, are set to increase on longer journeys to match ‘international norms’ when passengers cross ‘zones’ yet to be specified. By August, Bahrain Public Transport Company – a joint venture between National Express Group and Ahmed Mansoor Al Aali – will be operating 141 buses, compared to 35 today, covering a total of 32 routes and increasing the network service to more than 77 per cent of inhabited areas aimed at moving approximately 51,000 passengers per day. 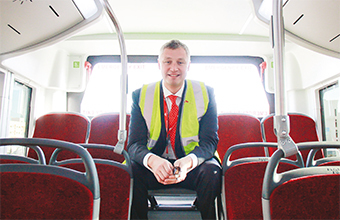 Mark Kipling, operations and mobilisation director, said: “Quite simply – let someone else take the stress of driving while you sit in air-conditioned comfort, browse the web using the on-bus Wi-Fi, and not worry about parking when you get to your destination. “The vehicles, which are some of the most advanced in the world, are manufactured in Germany and the UK – you can travel to work in a vehicle worth over BD150,000! The new company started operating on the existing bus route network last month using a mixture of German-built MAN buses and British-built Optare minibuses. “The fleet is loaded with technology to make commuters’ journeys safer and more comfortable,” added Mr Kipling, an award-winning British transport innovator who moved to the kingdom with his wife, Rachael, to help steer the project forward. Mr Kipling rose from the National Express graduate scheme to manage one of the largest city bus operations and at the age of only 25 was ‘highly commended’ in the prestigious UK Bus Awards 2009 following the successful integration of a major network review, leading an engineering team to a nationwide award and a 20 per cent reduction in lost mileage. “We have formed a strong partnership with Ahmed Mansoor Al Aali, so the bus service will benefit from the winning combination of international operating experience and decades of local knowledge of Bahrain,” he said. “At the moment we have over 50 people from the UK and across Europe and the Gulf working specifically on the mobilisation, but our main focus is on training our new, local recruits into the established practices of international urban bus operations. “All our drivers will go through an intensive and thorough training programme developed from best practice in safe driving globally, including the Royal Society for the Prevention of Accidents, and is based on the bus driver training programme National Express uses in the UK. “The driver-trainers are a mixture of local people as well as those with the best international and regional experience in driver-training. Our drivers are some of the best trained and safest in the kingdom today. “At the moment, customers just pay in cash on board. From August, you will be able to pay in cash but also pre-load your smartcard with journeys – buy weekly, monthly and annual tickets – which will really make catching the bus easier. “Our international experience means we can draw on a large geographical knowledge of bus operations. We have people in our team who have worked in bus operations in London, Birmingham, Madrid, Chicago, elsewhere in the Gulf, as well as here in Bahrain. Another issue the authorities have to tackle is inconsiderate motorists parking illegally where buses are supposed to stop to pick up passengers. The company is working with the Ministry of Transportation to expand routes and coverage of the bus network and improve frequencies and they appear to be talking from the same page, or at least the same timetable. The Ministry of Transportation and Telecommunications (MTT) Land Transportation Affairs, to give its full title, is responsible for developing the land transport sector in the kingdom. Its first major strategic project is the development of the public transportation network to enhance the service, facilities and supporting infrastructure in accordance with international standards and practices, with the long-term aim of encouraging use of public transport to reduce congestion, help solve parking problems and minimise environmental damage. To this end, MTT signed a concession agreement with Bahrain Public Transport Company to operate the new bus service for the next 10 years. On February 15, it commenced the transition phase of the new vehicles on existing routes. This will be followed on April 1 by the official launch of the full network, which will be rolled out in phases until August, when all the new routes and buses will be in operation. In addition to the new fleet and service, British firm True Form has been contracted to demolish and rebuild an estimated 400 bus shelters. Further development of the network will increase the number of stops to around 900 locations. MTT says it is ‘committed’ to developing a modern, accessible and convenient public transport system and infrastructure to ‘improve the quality of life’ for citizens and residents. Currently, bus-users pay a few fils to travel around but a new fare structure will be based on the number of zones covered by each route, which is the industry standard. The new price structure will be announced shortly and an ‘Oyster-style’ smartcard system will be introduced, similar to the one used for public transport in the English capital of London. Engineer Mariam Ahmed Jumaan, Undersecretary of Land Transportation and Post Affairs for the MTT, told GulfWeekly: “The new and improved public transport network has been designed to provide citizens and residents with a modern, efficient and accessible public transport solution that meets the growing needs of the Bahrain market and is run in accordance with international safety and service standards. “Once fully operational, the new public bus service will comprise 141 brand new state-of-the-art vehicles that will cover a total of 32 routes across the kingdom and increase network coverage to more than 77 per cent of inhabited areas, increasing reach, frequencies and reducing both waiting and travel times as a result. “The new buses are fully-equipped with all the facilities, amenities and state-of-the-art technology to improve passenger travel experience and cater to the requirements of all sections of society. No doubt there will be teething problems and obstacles to overcome on the way, but perhaps the rockiest challenge has already been encountered when some of the vehicles destined for Bahrain were caught up on the sea transporter Hoegh Osaka which grounded on Bramble Bank in the Solent. The incident prompted a major rescue operation with the crew members and a pilot having to be taken to safety by coastguard helicopter and lifeboats. Southampton Cargo Handling was later spotted unloading the vehicles from the salvaged ship.